We offer a wide range of event lighting and production in London & Surrey and surrounding areas. We can offer moving heads beams and wash to simple disco lighting. We even have the DMX controllers for hire too. We can offer you bespoke designs for any type of event be it a full on stage production, to lighting up a few trees. We will carefully plan with you and give you options for what you need. We will run through everything with you. All our lighting is available for dry hire too! 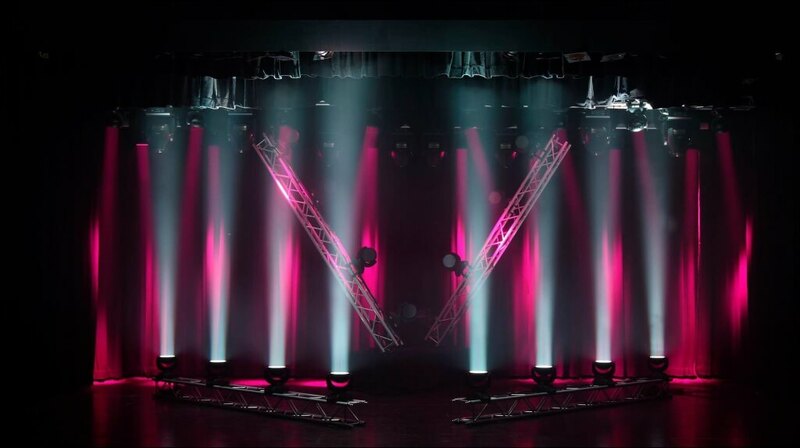 As well as all the lighting we can offer the truss system to rig it from. All of our lighting will come with power cables and we can offer various accessories. If you have an idea in mind get in touch and we will do all we can to make it happen! We can offer you special FX and decorative lighting too for your event such as Wireless battery uplighter, fairy lights and flame machines. please take a look here at our special FX section. Please take a look below at pictures of a few items we stock.